Legendary blues players performing live piedmont classics at their finest in the studios of B.B. King's Bluesville...just like the real-deal acoustic blues they’ve been delivering for nearly 30 years. 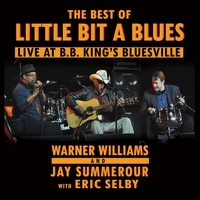 Warner Williams and Jay Summerour have been playing music together under the name of Little Bit A Blues for nearly 30 years. During their tenure together, they have recorded several albums, including one under the Smithsonian Folkways label. Eric Selby joined up with Warner and Jay several years ago, completing the current trio heard on this new and exciting release. Little Bit A Blues have played concert venues and blues festivals across the country—too many to name. Icons in the genre of piedmont-style, acoustic blues, Little Bit A Blues has become a fan favorite nationwide. Often shying away from the media spotlight, they have continued their musical journey together while gaining a large and loyal following. Individually and as a group, they have received numerous awards and recognitions in honor of their commitment to delivering real-deal, acoustic blues. Just in 2012 alone, Eric Selby was inducted into the Blues Hall of Fame, Jay Summerour received a WAMMIE Lifetime Achievement Award and 83-year-old Warner Williams was inducted by the National Endowment of the Arts as a Lifetime Heritage Fellow for his contribution to American music. This new release was recorded in a similar manner to how they perform their concerts: live, no musical edits and no overdubs. Whether it’s the beat-tapping of Warner’s boot or a much needed cough in between verses to belt out the blues, on this CD, you hear it all in its raw and honest form. Just like the real-deal acoustic blues they deliver. Soul Stew Records is not your typical record company. We work with the philosophy of “Starve The Ego, Feed The Soul.” Our artists work in a co-op partnership where creativity is paramount and the music is always first on the agenda. We promote and distribute blues, soul, roots, gospel, Americana and any other genre that is real and moves us.